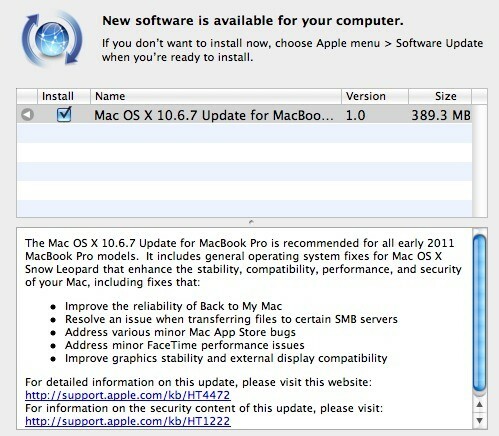 The guys over at Engadget are reporting that Apple has released a new update for OSX. It may be a minor update for most, but those with a brand new MacBook Pro will no doubt find the just-released OS X 10.6.7 upgrade particularly welcome. In addition to various minor improvements for all Macs, it includes a fix for early 2011 MacBook Pros that promises to “improve graphics stability and external display compatibility.” That sounds like it may actually fix both the freezing issue and the flickering issue that’s been plaguing Thunderbolt-equipped MacBook Pros since day one.